Once you have a madeleine baking tray making them is very easy. I used a Roux brothers recipe for Madeleines Au Miel; I have listed the ingredients as they gave them but have adapted the method slightly. Melt the butter and honey over a low heat and set aside to cool. Put the eggs, both types of sugar and the pinch of salt in a bowl and whisk until the mixture begins to turn light in colour and increases in volume. Sift the flour and the baking powder into the bowl and fold them gently, with the vanilla if you are using it, into the mixture. Lastly pour in the cooled melted butter and honey mix and stir gently until fully amalgamated. Cover the bowl with cling film and leave to rest for thirty minutes. 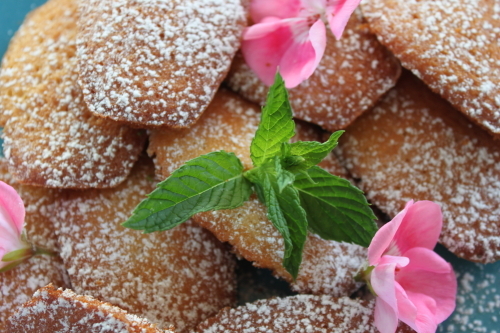 While you are waiting, preheat the oven to 220°C and prepare the Madeleine tray by brushing it with melted butter. Spoon the prepared mix into the cavities on the tray (do not fill to the top as they will rise) and cook for ten minutes only.